I had braces as a young teenager, but over the years I’ve had some spacing develop between some of my teeth. I don’t feel like I’d be comfortable with traditional braces at my age. In that case, would I be able to get Invisalign for this type of issue? It’s normal for our teeth to move some over the years. If your teeth and gums are healthy, you would be a fantastic candidate for Invisalign. 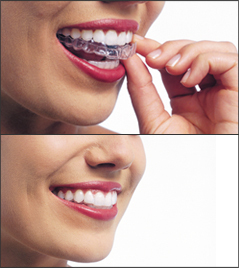 This is a lovely way to straighten your smile without anyone even knowing you’re wearing anything. In your case, you can probably get Invisalign Express which works in even faster. Aside from enabling you to repair your smile without anyone knowing and without a mouth full of metal, the Invisalign aligners can double as teeth whitening trays. This will give you a sort of mini smile makeover. It used to be that you’d have to see an orthodontist anytime you needed to straighten teeth. Now, it’s not necessary in most cases. Dentists can do Invisalign. Some even do braces. There are still times you would have to see an orthodontist when you have a very complicated case. That’s not you, so you shouldn’t have any problems. You just need to find a dentist who provides Invisalign. I think you’ll find it a wonderful way to get the smile you had and loved. While some movement of teeth is natural as the years go by, you want to make sure there isn’t another reason for your shifting. Specifically, you’ll want to make sure you don’t have any gum disease. If you see a dentist regularly and have good oral hygiene at home that shouldn’t be an issue. Your dentist will do an exam ahead of time to make sure you’re gums are healthy enough. If not, you’ll just have to treat the gum disease and then you can get the Invisalign treatment. This blog is brought to you by Tulsa Dentist Dr. Ryan Noah. This entry was posted in Invisalign and tagged braces, Invisalign and teeth whitening, Invisalign for spacing, Invisalign versus braces, orthodontics, teeth whitening, Tulsa Dentist, Tulsa invisalign. Bookmark the permalink.